My weekend plans where a visit to the Mystic Aquarium and the Hilton Gardens in Groton seemed like a great place to stay, less than a 15-minute drive to the aquarium. 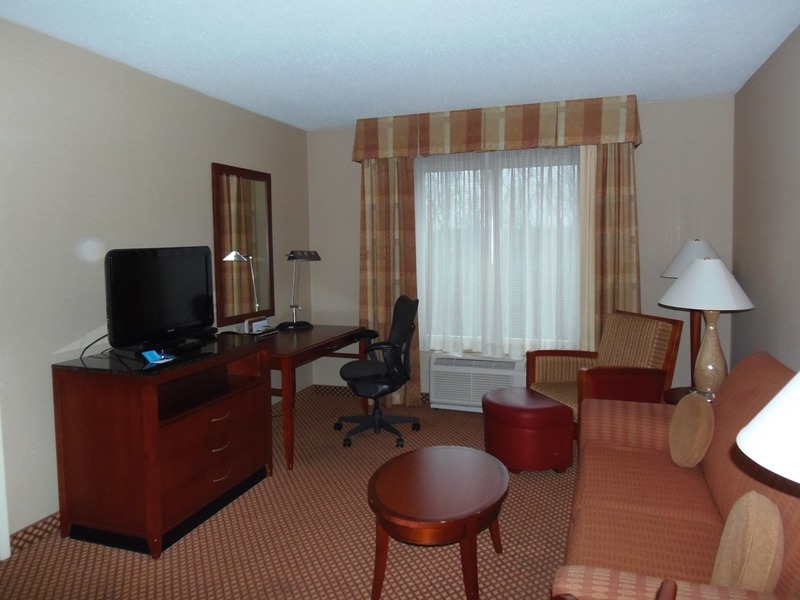 I always enjoy staying at Hilton properties and Hilton Gardens in Groton lived up to my expectations from Hilton. When I arrived at the hotel I found no line at the front desk, I did an online check-in the night before so my key card and reservation where already for me. A quick orientation for the hotels amenities and I was off to my room. On the way I stopped by the 24-hour hot beverage station for a coffee. I had a 1 King Bed 1 Bedroom with Whirlpool tub room. Upon entering my room, the first thing I noticed was how spacious the main room was. The separate bedroom was also just as spacious. This was the first time I stayed someplace that had a full bath and a half bath which I found a bit odd. 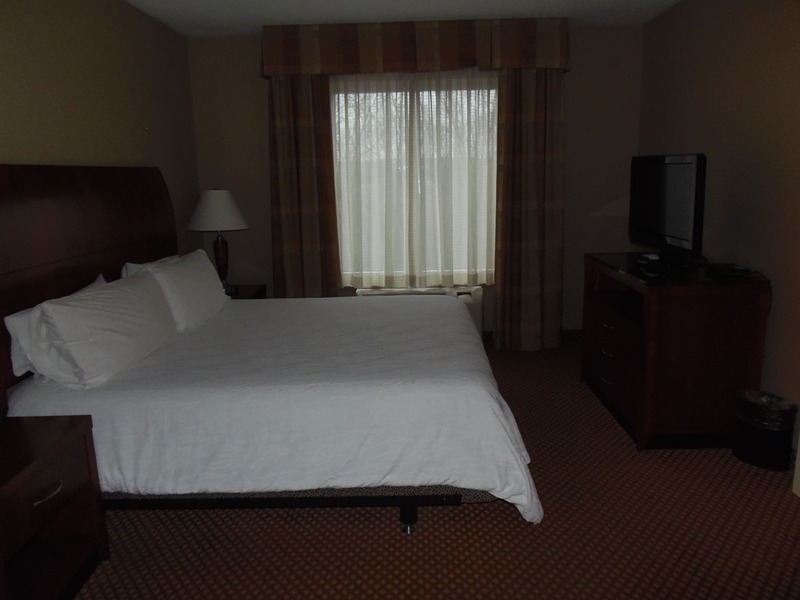 The suite itself was very clean and the temperature was comfortable. One thing I do like about Hiltons is that they always have a light on for when you enter your room. The bathrooms where both spotless. The main bathroom with the whirlpool tub had plenty of fresh, clean towels as well a collection of toiletries. The living area had a nice kitchenette with a Keurig coffee maker, a minifridge, a microwave and a counter with a sink. The main room had a pullout couch, a couple of chairs, a desk with another chair and a big screen television with a lot of local programing to choose from. The bedroom had the king bed and another television for sleepy time watching. Sleeping was great, the room darkening shades kept out all outside light including the morning sun. The room was also very quiet, I heard no outside sounds either from the rest of the hotel or outside. Morning and breakfast go together, and Hilton Gardens offers a mixed bag of breakfast choices. I went with the full buffet which includes everything available for the continental breakfast with a selection of fresh cooked choices including your choice of eggs and pancakes. The buffet had a great selection. A toaster with a collection of breads and such, I had a bagel with cream cheese, some fresh baked pastries, fresh fruits and juices and a self-serve waffle station. My eggs where perfectly prepared as a ham and cheese omelet. Staff was there doing a great job of keeping everything full. After my day of adventuring and returning to my room I was greeted by a fully cleaned and restocked room. Second night of sleeping was just as wonderful as the first night. Knowing that I would be spending a couple of hours in my car driving, I had myself a light breakfast. A bowl of Red Berries Special K and a bagel. Checkout was quick and easy. A printed receipt, handed in my key cards and I was on the road. Hilton Gardens Groton gets a double thumbs up from me for having a great staff all around. For being clean and for all around friendliness.